It’s Wednesday already!! I’m tardy to the party in linking up with Lindsey at The Pleated Poppy for this week’s “What I Wore Wednesday”. But in my time zone, it’s still Wednesday, so there. It’s been fun/annoying/intimidating/silly/challenging/encouraging for me to complete this weekly blog challenge for myself. Remembering to take pictures of myself pre-baby spit up, pre-4 year old fingerprints, and pre-I-give-up-trying-to-keep-my-shirt-clean has been tougher then I expected. I’ve also been challenging myself to wear more of my closet; rather than reaching for my favorites over and over again. My entire outfit is from Target. I didn’t even notice until I started to make a redundant list. 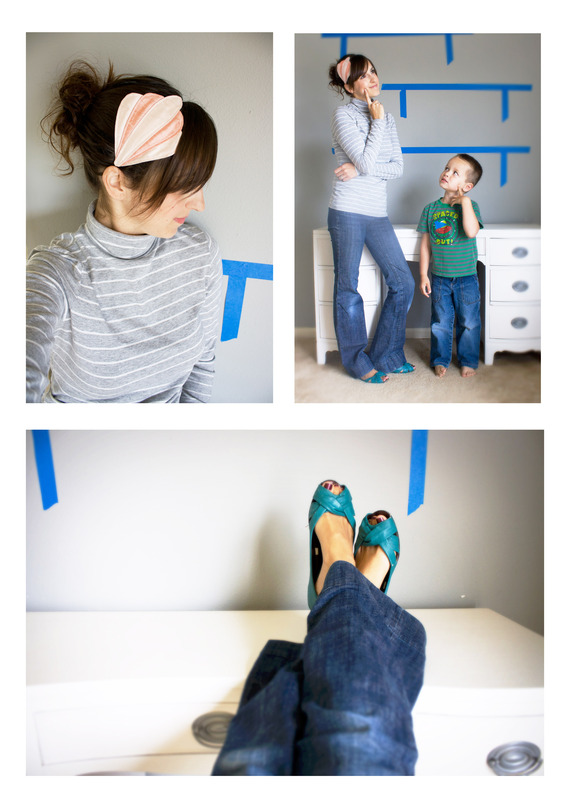 Blue painter’s tape on the wall actually has a purpose…. I’m going to be putting shelves above my desk and wanted to try different configurations without banging holes in the wall. Unnecessary holes in the walls make me angry…like turn green and get ripped angry. Mostly because I despise having to patch them. So, other than the fact that I’m clearly a walking advertisement for Target, I had fun challenging myself to be more creative with my clothes. P.S. I organize my closet by sleeve length (tanks, short sleeve, 3/4 sleeve, etc) and color….I’m OCD like that. Please tell me someone else out there does the same thing. What is your favorite store to shop at? Do you find yourself wearing the same colors frequently?